Your roof isn’t just a protective shield, capable of keeping you safe and warm at home. It’s also a big part of your house’s aesthetic. Just try to imagine what your property would look like if you changed your tile roof to a flat metal structure, or something similar. The look of your home would change dramatically. Whether you’re repairing your roof and you’ve decided that it’s time for a style update, or you’re looking into having your home built from scratch and need some inspiration, it’s worth keeping track of the current roofing trends. Here, we’ll look at some of the most popular ideas to hit the market in the last year. In the past, people used to assume that flat roofing was specifically reserved for apartment buildings or businesses. The average home used to shy away from this style, in favour of the additional space that a peaked roof could offer. However, new materials and techniques mean that you can now have a flat roof that looks chic and stylish, no matter what kind of property you live in. For instance, you could use a section of flat roof to create a garden on top of your building where you can grow plants and herbs. 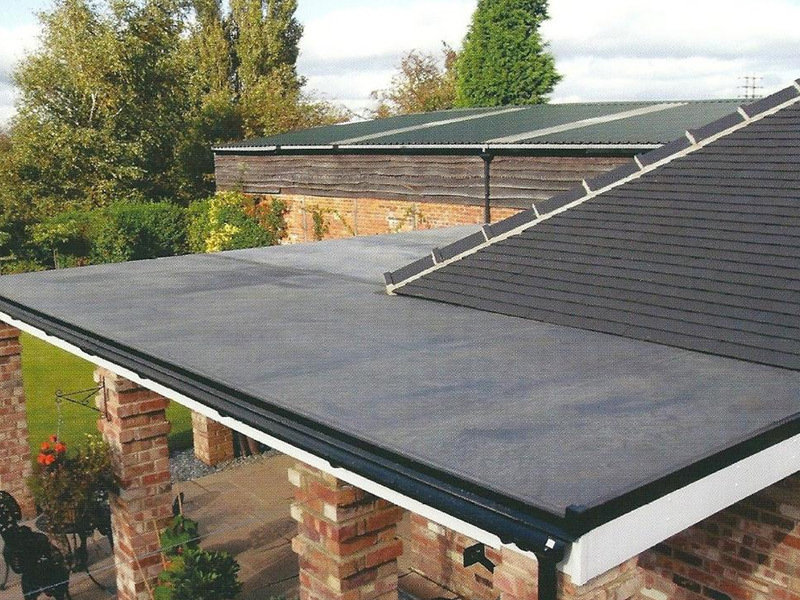 Alternatively, you could construct your flat roof out of coloured fibreglass for a truly unique appearance. As environmentally practices have grown more popular over the last year, so too have the trends for eco roofing. Eco roofing goes beyond ideas like solar panels, to consider things like hydro plants where you can gather water on your roof and funnel it through your home to help run your bathrooms. Another option is to fit a waterproof membrane onto your roof and plant greenery. This transforms your roof into another garden that can contribute to reducing carbon dioxide levels in the atmosphere. If you want to create a green roof, be sure that you consult an architect or builder for the process, as they do require additional structural support, and a special draining system too. Slate is another highly on-trend roofing strategy for 2018 and beyond. This versatile material both looks beautiful and is incredibly durable, which means that you can rely on it to last for a very long time. Slate comes with a selection of low-key natural shades to choose from, which is great for conveying the minimalist design concepts that are popular today. Slate is also popular right now because it’s environmentally friendly. However, it’s also quite expensive, and heavy, so you’ll need to make sure that you have both a strong roof structure and a strong bank account before you get started. Most of the trends that are prominent in the roofing space today have emerged because people want to do more to care for the environment. Energy conscious roofing continues that idea, by providing additional insulation to lower your energy consumption costs. There are also roofing options available that generate power through photovoltaic cells. As energy costs continue to rise, presenting a common problem for a lot of UK households, it might be a good idea to find out how you can utilise your unused roof space to create extra power. If you don’t like the idea of the traditionally mounted large solar panels of days gone by, then you can investigate the latest solar shingle roofs instead. These roofing materials look like standard tiles, but they can generate sustainable power for your home. Of course, solar shingles are a lot more expensive than solar panels. As more new homes continue to be built across the UK, some designers are beginning to play more with the options available to them in the way that a roof looks. Roofing manufacturers have responded to a need for unique aesthetics with a range of well-designed and innovative products that are both functional and eye-catching at the same time. One particularly common trend among designer roofing aficionados is the use of colour. Tile and shingle manufacturers have begun to experiment with dozens of new hues to really set a home apart in its neighbourhood. Additionally, you can also have your shingles arranged to form incredible patterns on your roof. However, it’s important to make sure that the style you choose won’t come at the expense of functionality. Whatever trend you decide to follow for your roofing this year, be sure that you have it installed correctly by experts with experience.